Be prepared to get seriously inspired, because this post is loaded with gorgeous table settings and centerpieces! First off, let’s focus on this rustic tablescape at Tone on Tone Antiques. So in love with this monochromatic setting. 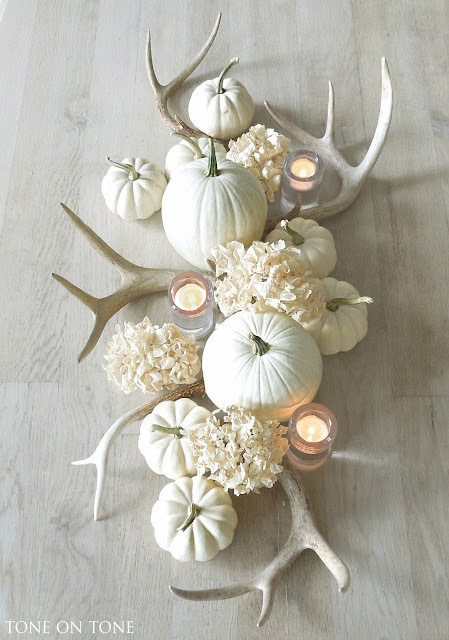 To keep the neutrality from looking flat, the blogger chose to use different textural elements, such as antlers, hydrangeas, white pumpkins and candles. A beautiful variety of accessories that go oh-so-perfectly together. Here’s a look at Liz Marie’s beautiful tablescape. I love how she used fringed dish towels as her placemats. And notice the vase filler…white beans (a very inexpensive option!)! Also, I love her diy chalkboard table runner. Isn’t Allison’s dining room at The Golden Sycamore just gorgeous?! This plaid fabric scrap turned table runner wasn’t even hemmed. I’m all about any project that’s quick and easy! Also, the tablecloth underneath the runner is actually just a dropcloth. I love to hear about how others repurpose items! Loving this simple, yet eye-catching, tablescape at Dreamy Whites Online. The ironstone plates, the rustic bread board, plain glasses, plaid fabric, textures from nature….Doesn’t it make you want to drop by and relax at her table? These accessories are everyday items that most of us already have in our homes. How lovely is that?! Loving this budget-friendly, neutral setting at the blog, Bless’er House. Simple and refined. Rustic and elegant. Oh, and if you happen to stop by her blog, she gives a detailed list of her purchases for this jaw-dropping autumnal decor. 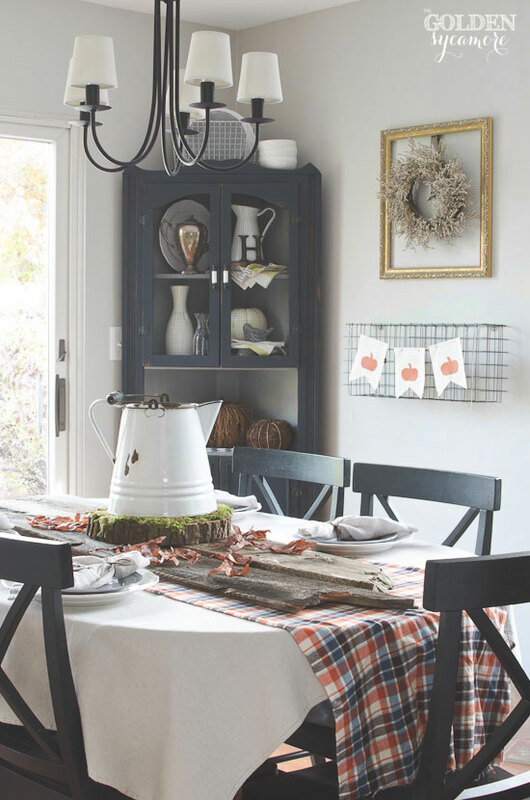 I’m smitten with Finding Home Online’s creative, rustic table. That old wooden box is something to behold. Its patina is gorgeous! She filled her box with an ironstone pitcher, wheat and pinecones from her backyard, pears, pumpkins and apples. A perfect combination. And here we are again at Liz Marie’s most recent Fall centerpiece. Don’t you just love that door that she repurposed into a table top?! And just a few faux pumpkins, along with outdoor greenery, look so pretty in her vintage dough bowl. 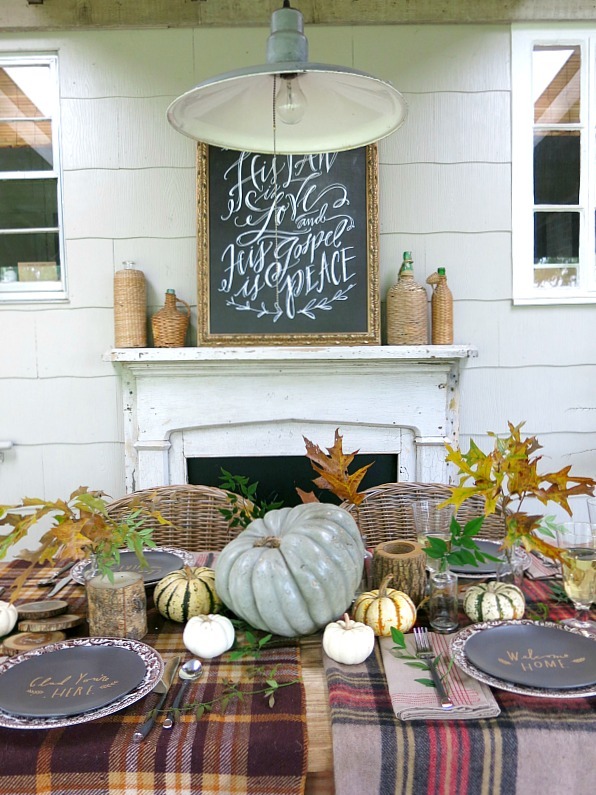 And I just love the simple and rustic tablescape that Holly Mathis put together! The mixture of plaids and the natural elements are stunning! And how about those dishes? She mixed both modern and traditional plates. Here’s another fabulous tablescape designed by Jen at City Farmhouse. Wowee! How about that plaid blanket stacked with the craft paper — love it! And those gold lanterns add the perfect touch of glamour in this rustic setting. 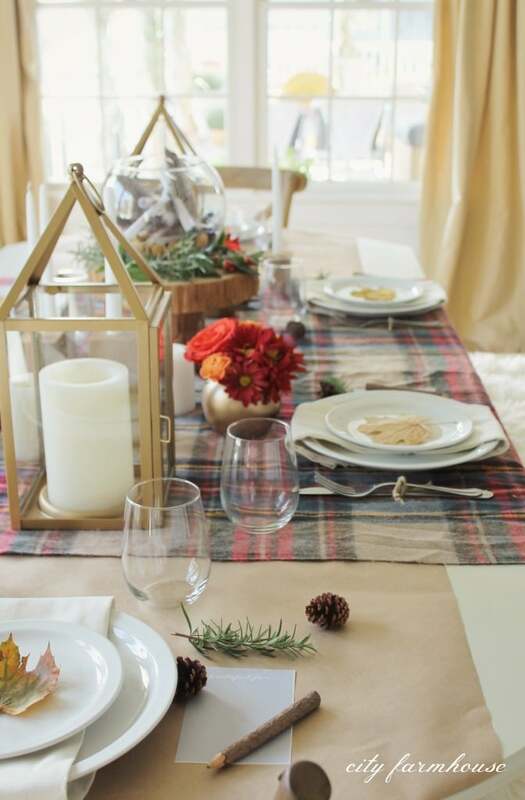 I love Lindsay’s stylish autumnal table at The White Buffalo Styling Co. blog! She actually decorated her table based off of her floral fabric napkins. That’s a great way to start when trying to decide what colors to bring into your tablescape. I also love how she used wood chargers and vintage green glasses, along with her ticking fabric runner. 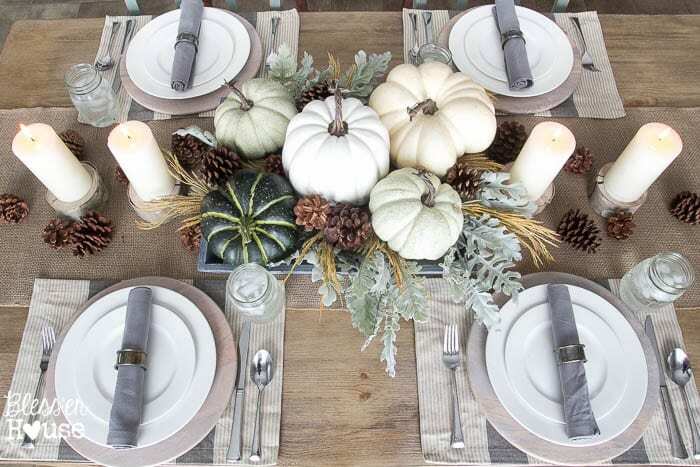 This rustic, yet refined, tablescape at Home Remedies Rx is so simple to put together! 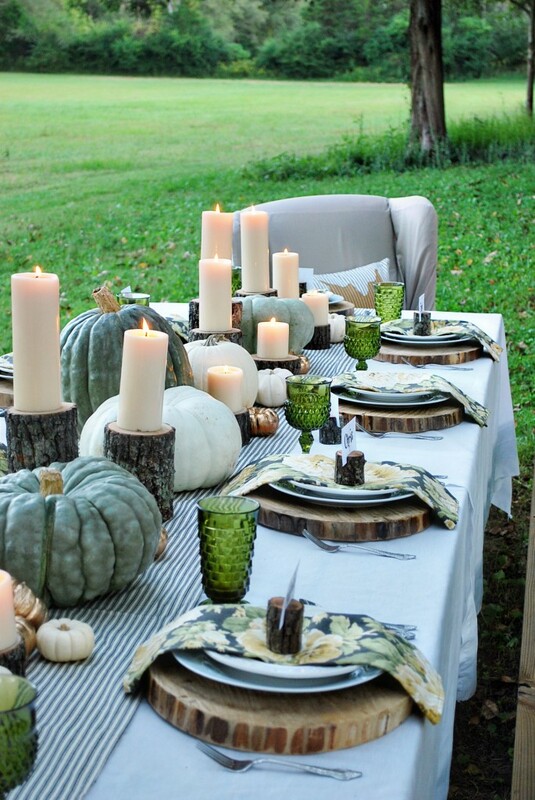 Faux pumpkins of various sizes and outdoor greenery, along with a table runner, create a fun ambiance when it comes to styling a beautiful table! 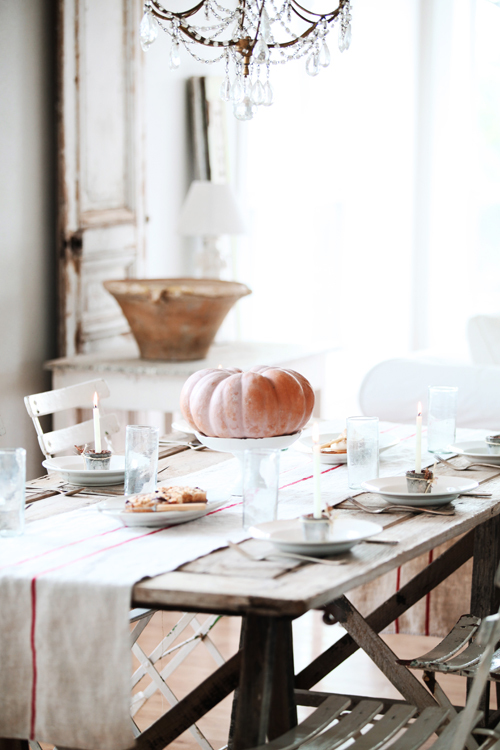 And yet another Fall tablescape from the beautiful blog, Dreamy Whites Online. I have such a weakness for French grain sack anything, so it was love at first sight with this vintage runner. 🙂 And notice those fun French baker’s cups that are sitting on each ironstone plate. The blogger filled these adorable cups with flax seed to hold the candlesticks in place. And lastly, in case you needed a little “brush up” on the proper placement of each piece, here is a very helpful description. So what do you think of this post, part 5 of the “Phenomenal Fall Favorites” series? 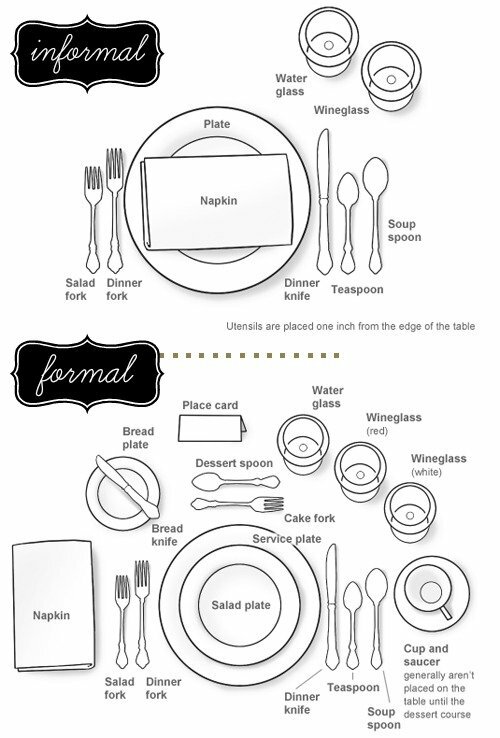 Which of all these tablescapes and centerpieces is your favorite? I hope you’ve been inspired to use an idea or two in your own home! Want to see more gorgeous spaces and inspiring projects? I’d love for you to stop by and say hey on my Instagram, Facebook, Twitter or Pinterest….Or comment below! I always love to hear from y’all! Thank you so much for featuring my fall tablescape alongside this group of talented ladies – this just made my day! Aww, really??!! That warms my heart! 🙂 Your tablescape is absolutely stunning! Perfect work you have done, this website is really cool with good info . Really informative article.Really looking forward to read more. Awesome. I think this is a real great article post.Really looking forward to read more. Fantastic. Thanks for sharing, this is a fantastic post.Much thanks again. Cool. Hey, thanks for the article.Really thank you! Appreciate you sharing, great blog.Much thanks again. Awesome. I just want to tell you that I am just all new to blogging and site-building and truly savored this page. Very likely I’m likely to bookmark your blog post . You actually have very good well written articles. With thanks for sharing with us your web-site. This web site can be a stroll-via for the entire information you wished about this and didn抰 know who to ask. Glimpse right here, and you抣l definitely discover it. Really enjoyed this blog.Really thank you! Really Cool. Hi there! I know this is kinda off topic however I’d figured I’d ask. Would you be interested in exchanging links or maybe guest authoring a blog post or vice-versa? My blog discusses a lot of the same topics as yours and I think we could greatly benefit from each other. If you’re interested feel free to shoot me an email. I look forward to hearing from you! Great blog by the way! Have you ever considered creating an e-book or guest authoring on other sites? I have a blog based on the same subjects you discuss and would love to have you share some stories/information. I know my visitors would enjoy your work. If you are even remotely interested, feel free to send me an e mail. Do you mind if I quote a few of your posts as long as I provide credit and sources back to your webpage? My website is in the very same niche as yours and my visitors would certainly benefit from a lot of the information you present here. Please let me know if this okay with you. Thank you! Hey there! I know this is kinda off topic but I’d figured I’d ask. Would you be interested in trading links or maybe guest writing a blog post or vice-versa? My blog addresses a lot of the same topics as yours and I feel we could greatly benefit from each other. If you are interested feel free to send me an e-mail. I look forward to hearing from you! Terrific blog by the way! Wow that was unusual. I just wrote an very long comment but after I clicked submit my comment didn’t show up. Grrrr… well I’m not writing all that over again. Regardless, just wanted to say wonderful blog! Greetings! I know this is kinda off topic but I was wondering if you knew where I could locate a captcha plugin for my comment form? I’m using the same blog platform as yours and I’m having difficulty finding one? Thanks a lot! I really like and appreciate your blog article.Really looking forward to read more. Great. Hello! Do you use Twitter? I’d like to follow you if that would be okay. I’m absolutely enjoying your blog and look forward to new posts. First off I want to say superb blog! I had a quick question which I’d like to ask if you do not mind. I was interested to find out how you center yourself and clear your head prior to writing. I have had a difficult time clearing my mind in getting my thoughts out there. I truly do take pleasure in writing however it just seems like the first 10 to 15 minutes are generally lost simply just trying to figure out how to begin. Any recommendations or hints? Appreciate it! First of all I would like to say great blog! I had a quick question which I’d like to ask if you don’t mind. I was curious to find out how you center yourself and clear your mind before writing. I have had a difficult time clearing my thoughts in getting my thoughts out. I do take pleasure in writing but it just seems like the first 10 to 15 minutes are lost simply just trying to figure out how to begin. Any ideas or tips? Appreciate it! Hey! I could have sworn I’ve been to this blog before but after reading through some of the post I realized it’s new to me. Anyways, I’m definitely glad I found it and I’ll be book-marking and checking back frequently!